Lots has been written about the Skymax 180 PRO Pro and it's a scope you will either love or hate. On its release it was almost universally condemned for its many supposed faults. These included the long cool down time and the fact that it was seen as very much a one trick pony. Many nay sayers were even convinced that Skywatcher could never produce a high quality Maksutov !!! This review is my own experience from using the scope for a few years and how I came to love this gem of a telescope from Skywatcher. Mine was acquired second hand for the good price of £300. Its previous owner found it too difficult to use for astro-imaging because of its long focal length at f15 and too much of a handful in weight and it is indeed a heavy scope weighing in at around 9kg for the tube only. Add to that its supplied diagonal and finder and you have a weight of around 10kg. Throw away the dreadful accessories and put a few extras on and the scope can easily start to top the scales at 13kg or more. The unit was originally acquired as a present for my sister but she too found it too heavy and too awkward to use and found it 'unlucky'. And so it fell to me to be its final owner and perhaps the first to really exploit this particular units potential after a long love hate relationship. The Skymax 180 on an EQ6 mount. Maksutovs have a reputation for compactness but larger ones like the 180 PRO can be quite a bit bigger than you may think ! The diagonal was appallingly bad being just about the cheapest and nastiest diagonal imaginable. The supplied eyepieces were a 9mm and a 20mm LET eyepiece which are not Skywatchers finest by any means. The finder is the fairly standard Skywatcher 8x50 straight through finder which is standard on most of Skywatchers range and is basic but good. Why Skywatcher choose to ship such a finely engineered telescope with such poor accessories like the cheap diagonal is anyones guess. To my mind it should either have been supplied with high quality extras or none at all. Newer models are in fact shipped with a better quality 2" diagonal and a 28mm LET eyepiece. One small headache with the Skymax 180 PRO was that the finder could not be bought into collimation with the main scope optics. The reason for this is that the finder shoe is mounted on the gently sloping rear casing of the telescope and as a result the finder is tilted very slightly - enough so that its adjusters cannot bring it into collimation with the main scope. I have heard other Skymax owners complain about this. Its easy to fix with either a paper shim on the finder shoe or simply remove the finder shoe from the scope and file it down. Don't worry about this because there are no bolts to fall down inside the scope. The threads for the accessory shoe are cut into the scopes rear plate. The focuser on my scope was a model of smoothness with enough friction to give it a good feel. I have found some Mak/SCTs tend to have far too loose a focuser and lack any feeling at all. 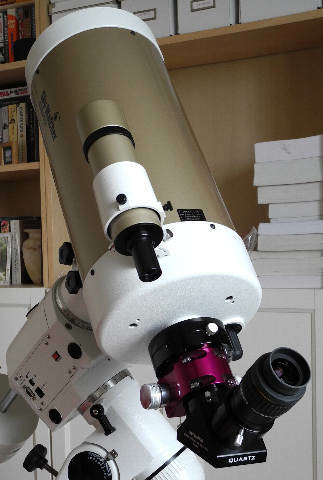 My first upgrade to the scope, even before first light, was to sell off the dreadful diagonal and the LET eyepieces. The LETs are passable enough for a starter set but I already had EPs of better quality. This reduced the overall price of the telescope for me. Mine was planned to be used with my TAL diagonal which is superb while the eyepieces would be a mix of Hyperions and TMB Planetary II types in my possession at the time of the scopes acquisition. These were later changed for UO Orthoscopics and Pentax XWs. My sister had complained that the Skymax 180 PRO had proven to be "unlucky" and claimed that every time it was bought out for use the sky went cloudy. I owned the Skymax 180 PRO for almost 14 months before it was given its first light due to the same problems and it did seem at times to be a cursed instrument. Like my sister I found the Skymax to be an 'unlucky' scope for weather. During these 14 months I also had a Rumak type telescope on evaluation and it never once got a good sky. The Rumak was an alternative and I had promised the vendor that I would test the two scopes and make my choice. The weather was so atrocious for so long and the few good spells were always at times when it wasn't possible to observe for one reason or another. In the end the Rumak was sent back and I was stuck once again with the Skymax which came to be called 'The Golden Jinx'. I was hampered in part because the accepted wisdom was that the big Maksutov would require at least three hours to cool down to ambient temperature when taken outside. This in part led to the scope never really getting a fair turn. As someone who is mobile and lives in a flat the scope was always passed over in favor of other scopes as I seldom had enough time to let a scope cool for 3 hours prior to use. First light for the 180 came at the Salisbury Star Party in 2010 and once again the scopes very own jinx appeared with a vengeance. On the first night the mount broke down. The second night was cloudy and the final night the dew was so bad that I couldn't keep the optics clear long enough to ever get a view and form an opinion. After the Salisbury Star Party I was sorely tempted to sell the 180 and felt that perhaps this was a scope that would never be of use to me. I did at one point sell the scope only to have the buyer back out. This would turn out to be the best luck of all....... though it didn't seem it at the time ! The Skymax 180 Pro at Salisbury on the HEQ5. The scope was to have a truly jinxed time at the Star Party. After endless set backs with weather I finally got to use the Skymax 180 in Winter 2010 and it showed enough mettle to make me believe it could be a real planet killer. After having bought a heated dew shield and dew controller to keep the optics dry (which is essential with this scope as it really can be a dew magnet) I finally resolved to get at least one view from it before I ran out of patience and sold it. Its first real light was with the moon full and extra ordinarily bright and crisp conditions so the seeing was far from perfect but lunar detail was astounding at even low power magnification. The 180 was thoroughly cooled down and the air was extremely cold and stable. I could well believe on lunar work on a partial moon the view might well be mind-blowing. Saturn came up late in the evening and the scope had reached thermal equilibrium some time before so was totally free of any nasty tube currents. Unfortunately by the time Saturn appeared the sky was showing faint traces of wispy high altitude cloud. None the less the scope rendered an extremely large and very sharp view of the ringed wonder and enough was seen to be convinced to allow the scope a reprieve from the 'for sale' ads. So the first night where the scope could actually be used turned out to be a mere teaser of what the scope might be capable of. Multiple uses of the Skymax 180 PRO over the following months created an awakening in the nature of a religious conversion. The scope was used progressively more and more and it became obvious that the supposed three hour cool down time was grossly overstated. In reality even from a warm flat into the near zero night air the scope seldom needed more than 90 minutes. Even after 20 minutes the scope would prove to be very usable so long as maximum power wasn't used or if it was allowances were made. As the scope was used more and more frequently it really started to show its mettle. Across 2011 lunar views with assorted eyepieces were astounding. Saturn and Jupiter were observed to be as large as I have ever seen them through a telescope and crackling with detail. The massive focal length of the Skymax 180 PRO means almost any eyepiece will work well with no chromatic aberration and pin point stars to the edge in almost any eyepiece. The ultimate views were with orthoscopics and Pentax XWs where the 180 gave mind blowing views of the moon, planets and even some deep sky objects. And so little by little the big Mak started to win its place and became progressively the scope of choice to take out. Superb on planets and competent on deep sky objects that are relatively compact. In fact some of the views of the Orion nebula were simply astounding across this period when the scope gave superb contrasted view of the gas clouds and faint structures inside the nebula. 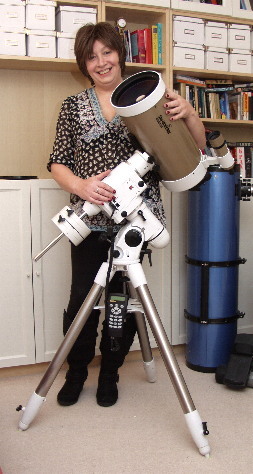 The Skymax 180 Pro with the Moonlite focuser attached. The Moonlite gave the 180 a much finer focuser and less wobble at high magnifications. One of the issues with the Skymax 180 PRO that became progressively more annoying was the image shift. This is because the focuser in a Maksutov pushes on the mirror and consequently can have the effect of moving the view as you focus. This can end up with a kind of constant messing with the focuser or the mount to keep a target in view and centred. For some of the viewing sessions where the Maksutov was being used at the upper end of its magnification this became very distracting and I resolved to fit a rear Crayford focuser with a 10:1 reduction for fine focusing. This would have the dual advantage of removing any image shift and providing a fine focus to reduce scope wobbles at high power. Eventually a Moonlite SCT focuser was fitted to the rear of the scope. The original Gold Tube versions of this scope use a conventional SCT adapter while later (Black Diamond) versions use a different thread. With the Crayford fitted the scope really did start to approach perfection. As already stated some form of scope heater, or at bare minimum, a dewshield is an absolute must for this scope as the corrector plate at the front really act as a massive dew magnet. During summer of 2011 I became somewhat nervous regarding 'clipping' of the light cone. The accepted wisdom amongst some fellow astronomers was that the fitting of the visual back/Crayford focuser and the use of a 2" diagonal would cause the image to be 'clipped' and reduce the scopes capability to that of a 5" Maksutov or thereabouts. 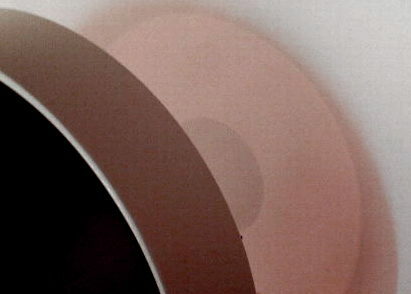 Clipping occurs when the optical train is extended on this type of scope (any form of external focuser or larger diagonal will increase the focal length). As the length is extended the light cone coming from the secondary mirror becomes wider and there comes a point when the length is extended so that the widened light cone is clipped off by the diameter of the rear portal of the telescope. Repeated observations did not appear to confirm this view and indeed views looked no different whether I used the standard 1.25" diagonal connected directly to the scope or used the external Crayford with a 2" diagonal. A kind of telescope paranoia and hypochondria started to etch itself into my consciousness and I started to worry that perhaps, even after the trials and tribulations so far, the Skymax 180 PRO wasn't in fact the scope I had always thought it was. The scope is put square on and close to a wall with a pale colored card attached. A long focal length (25mm) EP is inserted and a powerful light is shone into the eyepiece (above). Note: this is the test being done with the Moonlite focuser in place. You need to do the test also with just a diagonal to see if there is a change. 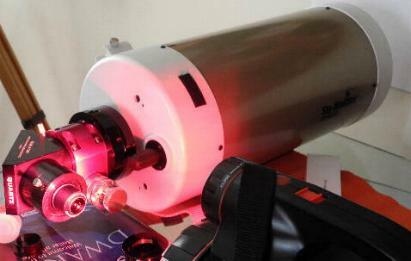 The scope will show a brighter disk against the wall or pale card. This can be measured to give a resonably accurate aperture measurement and assess whether the light path is constricted. Extensive reading on the issues related to the lengthening of the light path eventually turned up an interesting article on testing the true aperture of a Maksutov or SCT design. A simple test can be done by putting a high intensity light into an eyepiece on the telescope and measuring the size of the circle of light that the primary will project onto a wall situated close to the front of the telescope and square to the telescope tube. Ideally a green laser is required but this can be done with any large focal length eyepiece and a powerful torch. The results will not be as accurate as an optical bench with a laser but will yield a rough guide as the telescopes effective aperture. My Skymax was rigged up for testing and I found that the telescopes effective aperture is only around 170mm not the 180mm stated by Skywatcher. This is because the telescopes corrector plate is 180mm and the primary mirror is also 180mm. In a Maksutov the primary mirror must always be larger than the corrector plate. Now this smaller than stated aperture has both its ups and downs. The downside is that the scope is somewhat smaller than stated but the upside is that because of this aperture limiting effect by the primary mirror the addition of an external focuser and 2" diagonal has no detrimental effects on the telescopes performance. The ray tracing test vindicated my observing tests. The reason I could never see a reduction in the image quality or brightness was not down to my observing but down to the fact that because the Skymax is already aperture limited there would be no observable change in view by increasing its optical path. This caused me a few moments of anxious thought as I realised my 180mm telescope was in fact a 170mm telescope and therefore smaller than I had imagined. After a few moments though I thought about it and realised that irrespective of the discrepancy in aperture it still renders astounding views and consequently any theoretical limit is meaningless. The increase in the optical path does though affect the focal length. The stated focal length of the Skymax 180 is 2700mm but mine is probably somewhat longer and I have estimated around 2780mm. This has a small effect on the magnification and also increases the focal ratio slightly. Neither have an observable effect on performance beyond the theoretical. With all doubts now set aside, a fine focuser that doesn't introduce any image shift and the orthoscopic eyepieces which are ideal for planetary work the Skymax at last could run to its full potential. During Winter 2011 and Summer 2012 the Skymax showed more and more just what it could do. Outstanding views of planets and some of the best views inside the Orion Nebula I have seen. Beautifully contrasted clouds of dust around the trapezium with a finesse that's quite breathtaking. Lunar views on crescent moons have been astounding and the Skymax 180 has proven to be a great performer on almost any relatively compact astronomical body. One of the Skymax 180 PROs strength is its huge focal length and high focal ratio. Its long focal length means that even relatively low power eyepieces yield large magnifications and its high focal ratio means even the humblest of eyepieces will perform well, it also provides very high contrast and magnification. Because of the long focal length I have been able to use orthoscopic eyepieces for planetary viewing. Normally an orthoscopic eyepiece has too tight an eye-relief at the lower focal lengths that a non-Maksutov telescope can deliver for me. The Skymax allows me to achieve maximum magnification using much longer focal length eyepieces of typically 9 and 12.5mm. The combination of orthoscopic eyepieces and the big Maksutovs focal length provides incredibly detailed and sharp images on planetary and lunar views and high contrast images of many deep space objects as well. The sparkling performance of the Skymax 180 PRO on planets though is bought at the price of its narrow field of view. 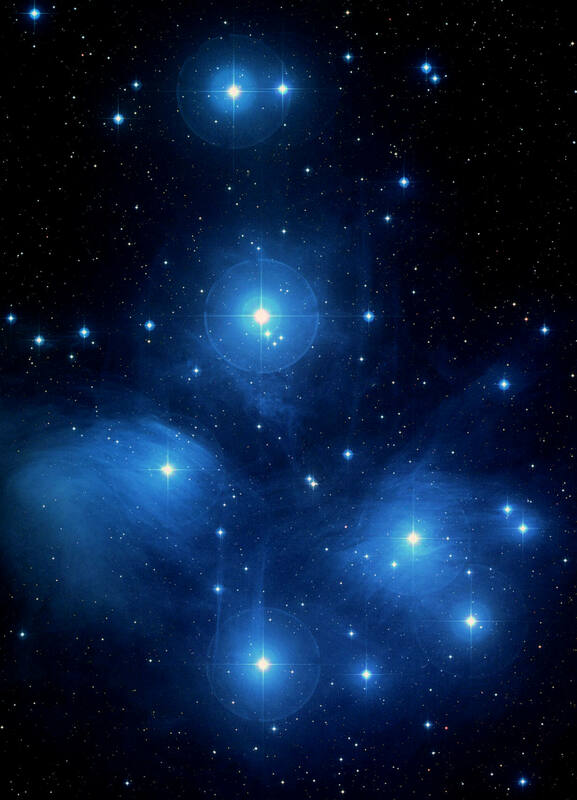 This means the scope is unable to see wide field objects like some open clusters in their full glory and by and large is limited to 1.25" eyepieces or at least eyepieces that have a smaller field lens than the exit portal in the telescope which is 25mm. The limitation on open clusters and large wide field objects is more apparent than real because there aren't in fact THAT many objects that cant fit in its field of view and its ability with compact objects more than outweighs the drawbacks with widefield objects in my opinion. On the subject of eyepieces some 2" eyepieces can be used if you can live with the inevitable vignetting. As an example the Explore Scientific 14mm 100' EP works acceptable well in the Skymax 180 PRO whereas the Explore Scientific 30mm 82' does not. The 30mm displays a terrible ring of fire around the field of view which is very distracting. People versed in the way of telescopes will know that no one telescope is perfect for all targets and eyepieces and so it is with the Skymax 180 PRO. 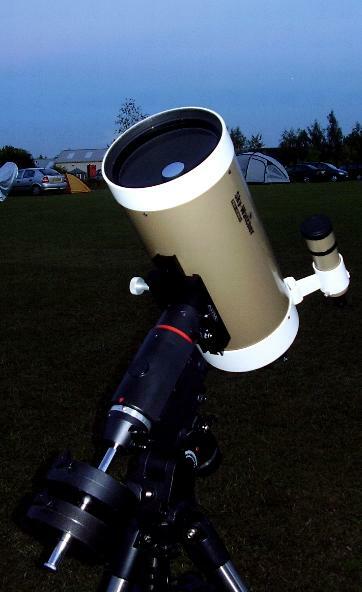 The telescope however is a worthy addition to anyones arsenal of telescopes and especially so if planetary viewing is one of their interests. The Skymax 180 PRO is often talked about as a one trick pony good only for planetary work - its far more than that. Its an extremely powerful and versatile telescope for the visual observer with a planetary performance that's probably unrivalled at its price. Its long cool down time is, in my opinion, vastly overstated and mine is often used with less than 30 minutes cool down time and renders very pleasing views indeed. Its been a journey of discovery with this telescope and at times I have come very close to selling it along the way. Its been a 3 year struggle to tame it but the path to telescope Nirvana is not an easy one as fellow astronomers will know. After trials and tribulations, cares and woes and many travails and curses I have finally learned to stop worrying and love the Skymax 180 PRO Maksutov.